Our exploration strategy is designed to deliver new resources that grow production, creating substantial value for shareholders. Exploration remains the most cost-effective way to access new resources, and our expertise, history and global reach give us advantages in this area. We have extensive acreage in high-potential basins around the world and have had significant success discovering resources in them. 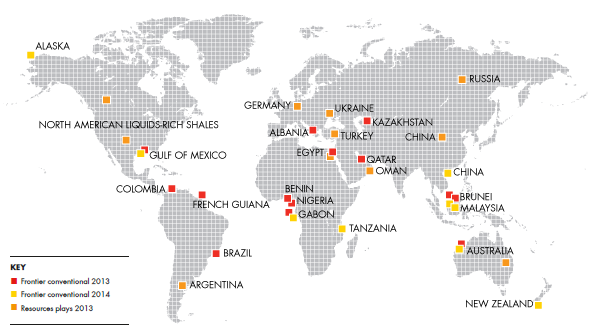 Exploration in conventional basins and resources plays are managed separately at Shell. Our exploration performance has been robust over the past few years. Seven notable new discoveries and appraisals were made worldwide during 2012 in conventional exploration. In Australia, Shell participated in three notable conventional gas exploration discoveries. One could add volumes for the Gorgon Train 4 liquefied natural gas facility, and the others could potentially lead to the development of an FLNG facility in the Outer Exmouth basin. In Malaysia, at the Tukau Timur well, we discovered more than 2 tcf of gas in place, which will unlock satellite fields, and should flow into Malaysia LNG. In Nigeria, the Zabazaba well appraised a sizable oil find. In the Gulf of Mexico, we drilled successful appraisal wells at Appomattox (more than 500 million barrels potential) and Vito, and in Brazil on the Gato do Mato structure. There were also 10 notable successful appraisals in resources plays in Australia, Canada, China and the USA.